and to feel anticipation about what will happen next! to use in their own stories. learning to read, so they can read to learn! At Keir Hardie Primary School reading is an integral part of school life; we recognise it as a crucial skill in being able to function in today’s society. A person who knows how to read can educate themselves in any area of life. Reading is taught throughout the school, from the pupils entering our Children’s Centre to leaving our school at the end of Year 6. 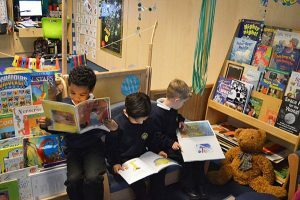 We decorate the Reading Areas in our classrooms to be as exciting and inviting as possible, to further encourage our pupils to read for pleasure. 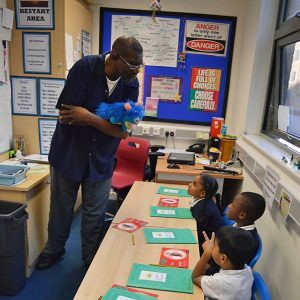 The aim of the Children’s Centre is to develop Oracy; for children to develop Speaking and Listening skills through games, rhymes and sharing of stories. 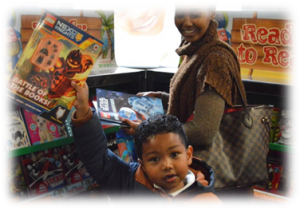 We encourage families to share in the enjoyment of books and spend time together to explore the world of imagination through reading. 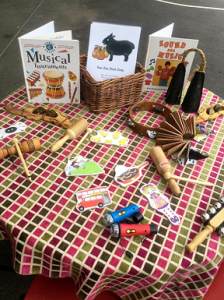 Pupils at our Nursery develop a love of language and books through listening to music, rhymes, stories and picture books. We always make sure that our children experience a text-rich environment. We hold a ‘Parent Reading Time’ every Friday. Parents stay to share books with their child, and demonstrate how important this time is to them and their children. We begin to introduce the children to the letter sounds they will need for reading. Many of our nursery children are already blending to read when they begin Reception and/or know most or all of the single letter sounds. In Reception, children continue with their phonics programme. Pupils are assessed and grouped according to their individual needs. This allows each pupil to focus on their own learning and apply their phonic knowledge. The phonics teaching follows pupils through to Key Stage 1, where pupils are introduced to more complicated sounds such as ‘split e’ i.e. long vowels sounds as in these words, ‘cake, time, cube, cone.’ Comprehension and fluency are learned and children begin to use their story voice. Once the pupils are confident readers, they begin to widen their comprehension skills using ‘Ruth Miskin Comprehension.’ The programme teaches children to comprehend and enjoy more challenging texts, explore and use new vocabulary, ask and answer questions that get to the heart of the matter and use grammatical features effectively in their own writing. In Key Stage 2, pupils read chapter books and advance their comprehension skills. When pupils have become confident readers, they begin the Comprehension Plus program which extends their inference skills; they discuss their opinions about texts and explain reasons for their opinions. All of our pupils have a ‘Reading is Fun’ book to record the books they have taken home. This book is an opportunity for both teachers and parents to record their thoughts about what the pupils have read, both at school and at home. Questions to ask about what they have read are inside the ‘Reading is Fun’ book to enable you to support your child with their reading at home. Bug Club is an online resource which makes available hundreds of e-books which teachers assign to the pupils depending on their ability. Each book contains pages asking them questions about what they have read. This is monitored by the teacher and followed up at school. Our pupils all have their own passwords to this resource in order to access these books both at school and at home. Pupils who enter our school during the academic year are assessed in reading according to our phonics assessment using RWI and through teacher assessment using the National Curriculum statements. Depending on the outcome of the assessment, pupils are then grouped according to their reading ability. 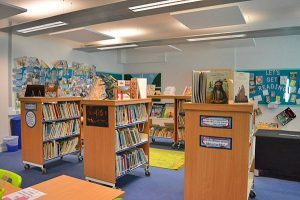 We have a well-resourced, welcoming, child-friendly library that is opened at lunchtimes and after school for pupils to borrow books. Our librarian champions reading for fun and rewards children with coloured wrist bands which indicate how often they visit the library. The children are encouraged to write book reviews and to discuss their favourite authors. 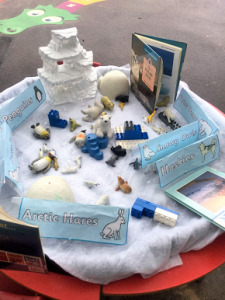 A display outside the library is focused on an author each term to inspire children to try books by different authors. The library also gives children and parents the opportunity to use computers. 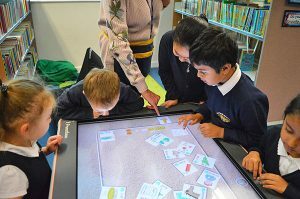 The giant I-Pad is a firm favourite with children of all ages. As parents/ carers, you are the child’s most influential teacher with an important part to play in helping your child to learn to read. Here are some suggestions on how you can support your child at home, making reading an enjoyable and positive experience. Choose a quiet time – set time aside with no distractions for 10-15 minutes each day. Be positive – boost your child’s achievement and give praise. Using books that may seem easy builds confidence rather than a book which has too many unknown words; building self-esteem is important when creating fluent and confident readers. Communication with school – each pupil has a reading diary. Communicate regularly with the class teacher to let them know how reading is going at home. This also shows your child that you are interested in their progress and that you value reading. 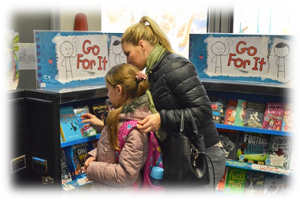 Read for variety – children need to experience putting their skills into practice so let them read the weekly shopping list, ingredients for a recipe, the football scores or comics. If it has words, your child can practice reading it! Use the Ruth Miskin Website www.ruthmiskintraining.com/parents, where you will discover more top tips to support your child at home, including parent tutorial videos and the ‘Sound Pronunciation Guide’ and *Fred games for oral blending. Remember to be a good role model by reading for pleasure yourself. Visit the school library – open from Tuesday to Friday, 3:30 – 4:30. It’s FREE! 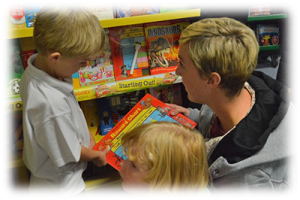 We run regular parent workshops and parent information meetings to enable you to support your child’s reading. A free crèche for younger children is usually arranged for your convenience by our children’s centre. Here are some photos from our most recent Reading is Fun workshop. How to support your Nursery child’s reading at home. Always turn off the TV, tablet, laptop… and give story time 100% of your attention! When reading a new story, stop mid-way through and ask your child to predict what might happen next/at the end? e.g. Do you think Sleeping Beauty will sleep forever? When reading familiar stories, ask one or two questions e.g. Why do you think Goldilocks is cross? Do you think Goldilocks should go in without asking? Run your finger along the text as you read, so your children begin to understand that text has meaning. Share non-fiction books too, or look things up in a search engine. Share books with your child that are at a higher level than they are able to read. This will expose them to vocabulary that they rarely hear in every day conversations. Build story time into your bedtime routine. Play *Fred games. Children who go in to Reception able to oral blend, begin reading real words much quicker than their peers who cannot. Play games like, ‘I spy with my little eye…’ to support your child to hear the first sound in words. Play lots of rhyming games. see them in action on the ‘Ruth Miskin Website’. How to support your Reception child’s reading at home. Make sure your child practices reading and writing the sounds they are learning, daily. Encourage your child to read their book every night. Never get angry when your child finds reading difficult – they are not doing it to annoy you! For new readers you may find two sessions of five minutes works better. Use Bug Club at home – Great for reluctant readers who think they are playing a game because it is on a computer/I-Pad! Once your child has become a reader they will need to learn to read with fluency to understand what they have read. Days 1& 2 – reading for accuracy – your child may need to ‘sound out/Fred talk’ many of the words in their new reading book. Day 3 – Count a 100 words – how long does it take your child to read the 100 words? Do this twice. Day 4 – as above – can they read the same 100 words in a minute? Play ‘jump in’ You read the book aloud as your child follows with their eyes. When you pause, your child ‘jumps in’ to read the word you have omitted to say. Day 5 – practise reading with a story voice – this should be easier now that they know the book so well. Use different voices for the characters dialogue. Day 6 – Your child should be reading the book perfectly by now – ask him/her questions about the text – there are examples in your child’s ‘Reading is Fun’ book. 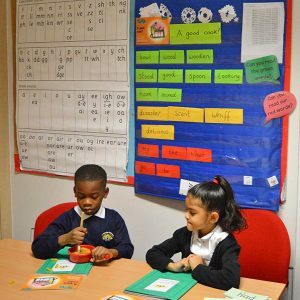 Phonics information meetings – we explain why and how we teach phonics in different year groups. You also have the opportunity to look at the resources we use and to observe phonic teaching in action. Phonics Check: During April we hold a ‘Phonics Check’ meeting, where we explain about the Year 1 compulsory check, and advise how parents can support their children. We reassure parents that the checks are very similar to the assessments we do every half term, we have even made our assessment booklets to resemble the National Booklet. Bug club information meetings – we explain why and how to access Bug Club in order to support your child with reading at home. Remember to play Fred games with your Early Years and SEND children. Being able to oral blend is a crucial step into reading. Can you guess which adults are reading? Each year we invite the ‘Book People’ in to raise the profile of reading for pleasure at home and to raise money to buy more books for our library. 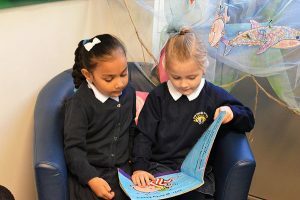 The Headteacher and Governing Body have decided to review the hours of the school day to include a 15 minute “Reading for Pleasure” session, where staff read to pupils so they can experience stories from different genres and authors. All our book corners are imaginative and welcoming to encourage the children to come in and pick up a book!